This stunning five-bedroom villa lies on Barbados' exclusive west coast, around halfway between Holetown and Speightstown. Looking out over the Caribbean Sea. 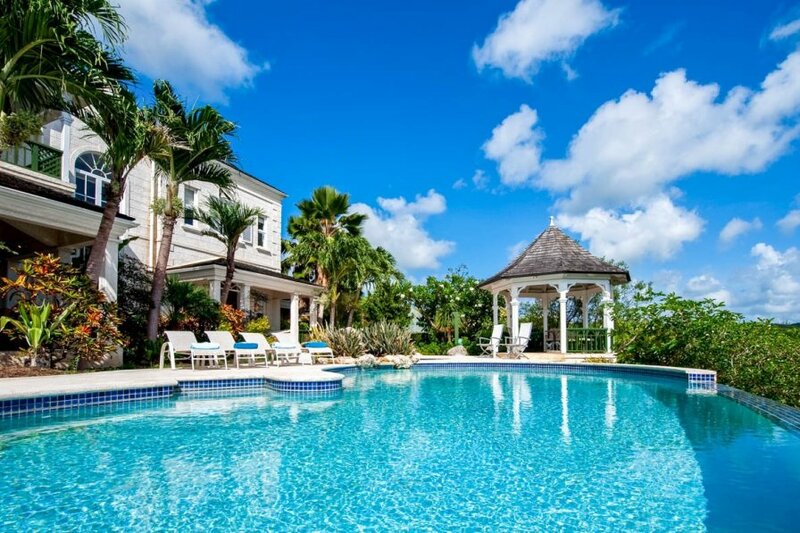 This stunning five-bedroom villa lies on Barbados' exclusive west coast, around halfway between Holetown and Speightstown. Looking out over the Caribbean Sea, Pandanus is set in beautiful gardens and has its own wonderful pool and terrace, ensuring you can really make the most of the sun. An elegant main house is joined by two adjacent cottages to form Pandanus. This staffed villa features exquisitely furnished terrace areas that are just perfect for dining and socialising. A gazebo sits beside the infinity pool which offers privacy in its sheltered position, and sun loungers are lined up next to the pool ready for lazy days. You are greeted by a grand reception area with chandelier and staircase, and to the right you have the main living areas. The spacious lounge is equipped with television and DVD, and the dining area can happily seat twelve. This area has direct access out to the terrace, and enjoys fine views through its large windows. A very attractive kitchen shares the same open-place space, featuring granite counters and high-quality appliances. A ceiling fan keeps things cool and comfortable, and the Caribbean breeze contributes to the feeling of airiness.You have five large en-suite bedrooms to choose from, each of them air-conditioned and stylishly appointed. Two of the bedrooms are in the main house, while the other three are in the cottages – you have three king-size bedrooms, while the other two have sets of twin beds ideal for children. Clean, tranquil beaches like Gibbes Beach and Mullins Beach are just a few minutes away from Pandanus, while the nearby coastal highway will lead you north to Speightstown in around nine minutes or Holetown in 15 minutes. The former was once an important port and retains an industrious, authentic feel, while the latter is a centre for the upscale dining, shopping and nightlife that the Saint James area is known for. Pandanusis a 5-bedroom villa that sleeps up to 11-guests. There are two additional cottages that can ensure some privacy for a group of your guests. Formerly an important port, nicknamed ‘Little Bristol' in reference to its trade links to that British city, Speightstown has an authentic edge which sets it apart. It hasn't been overly developed for tourism, aside from a recent marina development, and this is perhaps what gives it its charm. While it's no longer a seafaring hub, it's still busy and enjoyably historic. A museum and gallery of Caribbean Art are among the attractions worth seeking out. Just north of the town, the Six Men's Fish Market offers a taste of this still-important Barbadian trade. On Friday and Saturday nights, there's a fish fry with drinks and side dishes, where you can the fresh catch under the night sky, often with live entertainment. It is also a popular area for scuba diving – a 165ft-long wreck called the Pamir lies just off Six Men's Bay, and is the impetus for many people to get down there and see it. As you head south of Speightstown, you come to the glamorous area known as the ‘platinum coast', where the rich and famous come to play. Even without the luxury stores and hotels it's a good-looking place, with beautiful white sands and quiet coves lining the stretch around Holetown. This is the place to be if you're looking for upscale nlghtlife, much of it around Holetown's First and Second Streets, where you'll find cool hangouts like the Red Door Lounge. There are excellent beachfront restaurants and bars too, and a great atmosphere as you stroll along the boardwalk as the sun sets. If you choose to head inland from Speightstown, you will be rewarded by the natural beauty of the Farley Hill National Park. Only eight minutes' drive from town, it enjoys a fresh Atlantic breeze from the east, and views of the coast too – a fine place for a picnic or to enjoy some live entertainment, as it sometimes hosts events like the Barbados Reggae Festival.